Yeah, there's no way around it this time. "WOW!!!!!!" 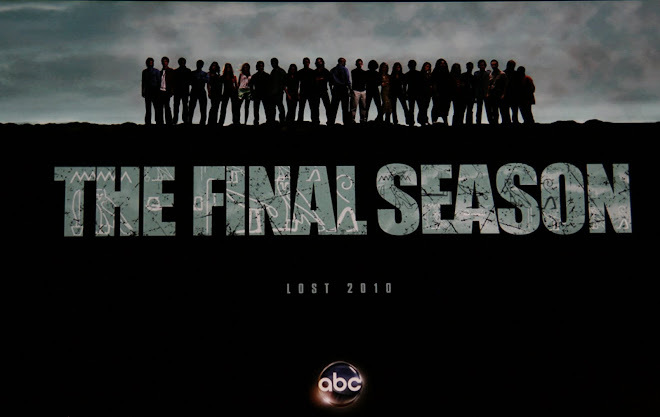 What a spectacular summation of what season 2 of Lost has been all about. We opened some chapters this year and ultimately closed them, only to introduce an even BIGGER mystery on (AND off) the island. This 2 hour opus was PACKED with useful information in the overall mythology of what Lost is all about. And the biggest thing the creators of Lost did was permanently dispel several rumors that have been going around. Rumors that even I have gotten caught up in. Then again, some rumors that started to begin even last year were confirmed as true (maybe)! Obviously, some of the storylines were intertwined as we went through the episode, but we'll try our best with this format! Basically Jack hides information from the rest of the crew of his and Sayid's suspicions of Michael's intentions. And they go on one more whirlwind NORTH-bound island adventure. Little does Jack's crew know that Sayid is taking a sailboat to the North shore to scout the area. A sailboat that was CORRECTLY identified by yours truly as Desmond's Sailboat (well, kinda Desmond's...but he WAS inside wasn't he?) There's nowhere else that this fits so let's just put one Present Day Desmond tidbit right here: So Desmond sailed west for probably a month and change (all of season 2) and ended up right back on the island. Then he called the place a SNOWGLOBE and that there is no way out. This kinda hints back to the whole Biosphere or controlled environment theory that's been floating around. But who knows? It seems that Desmond doesn't! So why should we take his Snowglobe comment to heart? Let's start off with some humor. Sawyer finally realizes what Jack meant by "we got caught in a net" as he almost sets off a Rousseau trap himself. Kate didn't find out yet about Sawyer's relations with Ana Lucia, but we can be sure the cat will eventually come out of the bag. Okay, so how about that crazy Eagle or Bird or whatever? The thing definitely sounded like it screamed "HURLEY." I didn't realize it until Hurley said it himself and I took the opportunity to rewind the TiVo. Apparently they encountered a similiar Bird during the season 1 finale when they were enroute to get the dynamite (which happened to have Jack, Kate, and Hurley in that party). I don't recall that but apparently the bird screamed "Hurley" then too. What DID result of this interaction was that Michael realized that his Gun was loaded with an empty mag. Uh Oh. Well we did get at least ONE confirmed death in the episode. And that would be one of the crazy OTHERS that were trailing our rescue team. I believe Kate got the shot off and the other guy went running. This caused all to come out in the open and we got to see some actual GOOD dramatic acting from Hurley as he sincerely looked like he wanted to strangle Michael upon discovering the culprit behind Libby and Ana Lucia's death. The crew stumbles upon a depository area for tons of the crazy containers from the Pearl Station Air Chute. They seemed to have gone to nowhere. Hmmm perhaps we got confused to WHICH station was the experiment. Sawyer also stumbled upon Locke's map that he sent through the air-mail. Did Jack recognize the scribbling from his intimate sessions with Locke in the hatch a few episodes back? That would seem like a stretch. Sayid sets off the Black Smoke (a nice parallel to the season 1 finale where that signified that the "OTHERS" were coming) to signal to Jack that he has arrived at the North Shore. It seems to be miles away from where they are. And then they are captured and seized by The Others. What on earth did they got shot with? Crazy Taser Darts? Did anyone else hear that electronic buzzing sound they were making? Whatever it was, it incapacitated the crew. Henry puts on a whole show about how they are the GOOD guys and demonstrates this by seemingly allowing Michael to get the boat and take Walt off the island at bearing 325 and they will find rescue. And he adds the comment "Once you leave, you can't get back." We'll get into some theorizing about this when we return to Desmond's story. Do we really think that Michael and Walt are LEAVING the island and will be rescued? I have 2 thoughts....either YES they will get off the island and it will lead to a developing plotline discovered in the cliffhanger last night....but I'm leaning towards NO that they will NOT find their way out of the SNOWGLOBE, as Desmond so nicely put it. Then again why would Henry let Walt go when he said they got more than they bargained for when they got him? Did he freak them out? Does he have some plan in mind? Yeah, I'm going to say there is a plan. Guess we'll find out at some point in season 3! Henry also lets Hurley return back to the other survivors. The others state that his purpose was to tell everyone that they should NOT return to where they are. You could sense Hurley's regret in leaving Jack, Kate, and Sawyer behind. How is he going to know how to get back? He was blindfolded on the way there! We leave these 3 main characters with the signature "OTHERS" hoods over their heads and them being taken to their main base. This should set up an interesting start to season 3, which is surely being defined as the season we will learn more about these "Others." Sayid is able to formulate a plan after acquiring Desmond's sailboat that he will arrive to the Other's camp before Michael leads Jack and crew there and scout the area. He recruits Jin to come with him, but someone will not be separated from him again. Sun learned her lesson in the season finale of Season1 when she let Jin go on the raft after reconciling with him. Was one more nice parallel that she decided to accompany the scouting trip so she could stay with her man. She argued to Sayid that she would serve as a translator. On their journey North, Sayid and crew stumble upon a crazy partial statue of a foot with 4 toes. 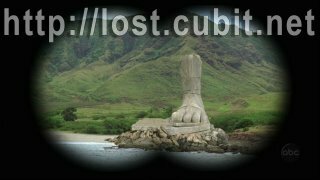 I will revert to some excerpts lost.cubit.net found about the image sinceI have nothing to add here. But I do love the image! In "Live Together, Die Alone", Sayid borrows Desmond's boat and sails with Jin and Sun to the north side of the island. Along the way, the come across a strange finding. They spot a statue of a giant foot with four toes on the shore. The statue is broken, and all that remains is a foot. The statue is reminiscent of the Colossus of Rhodes, one of the seven wonders of the ancient world. toes remaining: there were many here once." before yesterday we fished Bacchus out of the horse-pond."" They also identify the crazy Stonehenge type ancient remains where the others "SEEMED" to be residing. We discover that the camp is deserted and that hatch door that was being guarded, simply opens to a WALL. Straight out of a road-runner cartoon. More confirmation that the Others are not who they say they are! (which Walt told us last week and Kate discovered in the Medical hatch several episodes ago) Stay tuned for season 3 for more fun with the OTHERS! Wow, yes the flashback itself was wow-worthy. We have been hoping all season for more information on what was going on down in that hatch, and the season finale didn't disappoint! But Desmond's flashback gives us even MORE history before just his Hatch days. And it uncovers even MORE crazy twists in the Lost mythology. Are we ready to break this one down? Let's give it a shot! We discover Desmond's story begins with him leaving prison and being dishonorably discharged from the Scottish Military. The Good news here is that there seems to be more story to tell for how he ended up there in the first place. That may just mean that Desmond will return NEXT season! Desmond's belonging's that were returned to him included Charles Dickens's Our Mutual Friend If you want to read more about why the producers chose this book to be the last thing Desmond reads before he dies check out this really insightful article. Thanks Maya for sending it to me! We also discover Desmond's full name is "Desmond David Hume." Check out comments from our teaser blog from anonymous for some insightful information on David Hume. The John Locke he/she refers to is the REAL John Locke...not our resident island baldy. "Desmond's full name is Desmond David Hume, an undisguised and obvious reference to 18th Century Scottish philosopher David Hume (1711-1776). Hume was influenced by the works of John Locke, and also a critic of some of Locke's theories, such as the people's consent of government, man in the state of nature, etc. Hume also believed that all reality was relative and might be a figment of one's imagination. " Thanks anonymous! 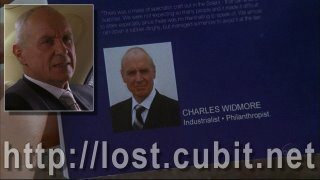 Kinda interesting how there is some built-in conflict between Locke and Desmond's characters in Lost, but they are both equally intrigued by the Hatch and the infamous "Button"
We FINALLY find out who was in that picture that desmond took with him as he fled the Hatch early in season 2. We had all speculated it was Sarah (Jack's ex-wife) based on how Desmond talked about Sarah. Boy were we off-track! No, the girl in the photo is none other than Penny Widmore (as I stated before, she was the female lead on the HBO Series "Mind of the Married Man" which I think I was one of the only people that watched), daughter of Charles Widmore (aka Caleb Nichol from The OC (I know some of you out there are closet watchers!) or Season 2 Vice-President on 24). Ahh there they are again...The good ol' Widmore family. It's all starting to make sense with Widmore Constructions being on a sign in Charlie's flashback in the infamously horrid episode "Fire + Water" since they were in the UK. Of course we can't forget Sun's pregnancy test was ALSO a product of WIDMORE LABS. 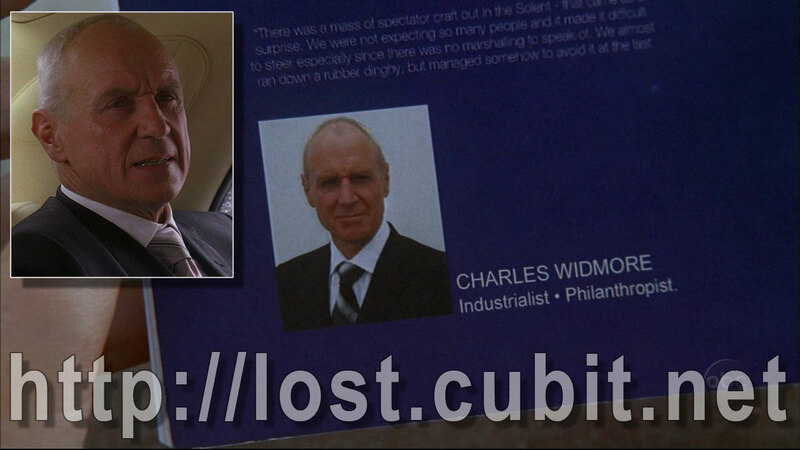 We can sure bet that the Widmore family will play a huge role in the future mythology of Lost. I would even bet there are ties to Dharma and/or the Hanso Foundation. 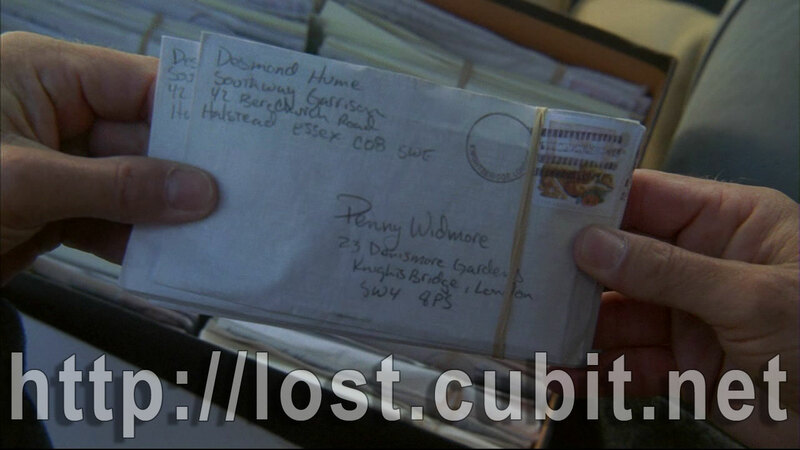 Apparently Mr. Widmore had confiscated all of the letters Desmond had ever written Penny during his sentence. We get a good look at one of the envelopes. Apparently Penny lives in Knightsbridge which is where the girl LUCY lives. Lucy was a girl in a season 1 Charlie flashback that tries to get Charlie a job with her father in the copier business. The relevance? There's not necessarily any relevance. Except that now 2 Charlie flashbacks relate to Widmore. Charles apparently tries to buy off Desmond from ever seeing his daughter again. It seems that there was a run-in in the past that led Desmond to serve time in prison. Desmond takes the money but is on a mission to win over Charles by winning a sailing race around the world (sponsored or something by Mr. Widmore). So no Mike (that would be me talking to myself), Desmond was NOT racing around the world trying to recruit people for the Dharma initiative. OOPS! Desmond arrives in America (I'll guess Los Angeles) and has a run-in with our buddy Libby! We get a bit more information on her at this point. Apparently she was married to a man named David (could or could not be who Hurley's imaginary friend was) who died an early death. There could be more to that story! Stay tuned! Anyway, and upset Libby with a crazy hairdo gives Desmond her husband's sailboat named after her "Elizabeth." Ironic that at Libby's funeral, her dead ex-husband's sailboat comes sailing up on the island. Crazy stuff. Desmond has a run-in with his life-long love Penny...right where he runs into Jack for the first time. (At the crazy stadium where they're both running the steps). Penny apparently tracked down Desmond since Desmond was asked to remain out of her life. She clearly still has feelings for our Scottish buddy. And she mentions in passing the Charles Dickens book that Desmond is still waiting to read. We later catch up with Desmond trying to sail through some stormy waters and then we see him in familiar territory. We see a bunch of people in Hazmat suits running towards Desmond and then bringing him into the Hatch. But then, we only see one man after that. And it's good ol' Jon Inman from the Gulf War. The man who taught Sayid to become a torturer. But no, he doesn't go by Jon on the island. He is KELVIN Inman. Yes the very same Kelvin that Desmond talks about early in season 2. We are meant to be confused by Kelvin's true intentions with Desmond. And we need to get through all of the details before we can start dishing into theories! Kelvin asks Desmond the same question Desmond asked Locke "Are you Him?" and "What did one snowman say to the other?" Desmond must've thought this is what you're supposed to ask your replacement. It was probably just some crap that Kelvin made up. Anyway, in case anyone has been wondering all season what the punchline to the snowman joke is....it was "smells like carrots." Yeah, I think we alreay knew. Kelvin apparently also was carrying on the task of his old partner Radzinsky who had started drawing the map of the island with Dharma Detergent and his photographic memory. Apparently they could never SEE what they were writing. We are still unsure if Desmond continued drawing that map after Kelvin died. Kelvin tells the story of how Radzinsky blew his brains out in the hatch. Apparently he got a bit stir crazy. We learn of the Fail-Safe key. Kelvin says it's the only other way out. Turn this key and this all goes away. Kelvin got drunk any couldn't bring himself to do it. We learn more about the "INCIDENT" referred to on the Orientation video. We confirm that there IS an electromagnet hiding in the swan hatch. Geologically Unique. There was a leak, now the charge builds up, everytime it builds up the button discharges it before it gets too big. So why do they push the botton when they can just turn the thing off? Well I guess we don't quite know what this key does just yet, do we? Kelvin asks "Do you have the courage to take your finger out of the Dam and blow the whole thing up instead?" Man...every scene in this flashback seemed important. The final one with Kelvin shows Kelvin with a ripped hazmat suit going out of the hatch.....Desmond decides to follow him. Kelvin takes off the suit once out of the hatch....and Desmond realizes he's been HAD. He follows kelvin across a great distance (great enough to take longer than 108 minutes) and finds that Kelvin has been working on Desmond's sailboat (if it had even been damaged)...and he was going to escape. Now we know where Desmond was running to in those early season 2 episodes! One thing leads to another and Desmond accidentally kills Kelvin....oops! We follow Desmond back to the Hatch which is under a crazy SYSTEM FAILURE. 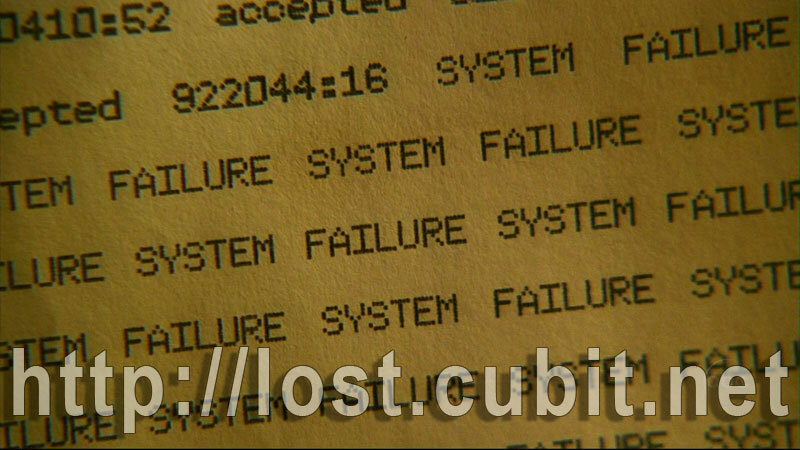 What we learn is that this System Failure happens to have occurred on September 22, 2004 (WE FINALLY HAVE A YEAR!!!!) Things were getting pulled into the magnet.....flying all over the place....Desmond finally keyed in the numbers and everything shut down. 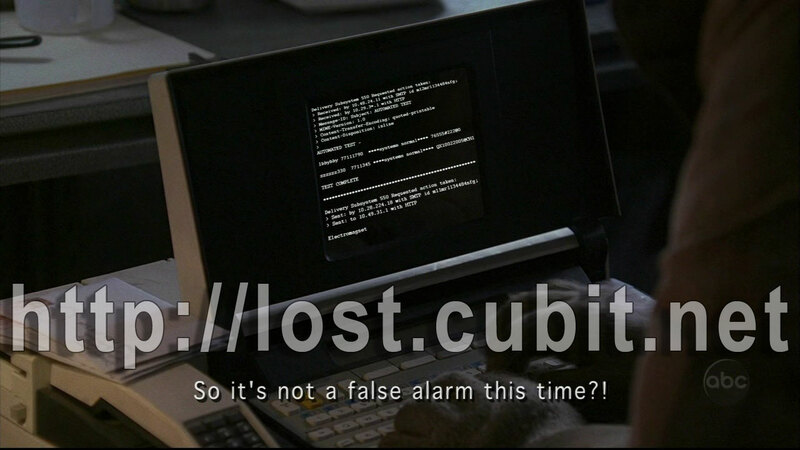 Could this be what Crashed Flight 815? Desmond seems to think so. And based on what we see later, we may be inclined to think so as well! The crazy thing is.....this was everyone's original theory once we saw that crazy button. "It must activate the magnet and somehow that pulled the Plane down." was a very common theory. Did we just seem to forget about it after all of this time? Sure we did....because they've been leading to think that the whole thing was FAKE! Damn crafty writers! Finally, the final flashback scene shows Desmond preparing to read his book, and preparing to put an end to his miserable existence. When a letter from Penny falls out of the book telling Desmond...I have not given up on you. And was supposed to reach him at the most desperate hour. Also, what happens was HOPE.....he heard knocking on the hatch door and he shined a spotlight up and there was John Locke. Anyone remember Season 1 when Boone fell in the plane? John went right back to that hatch looking for answers and a LIGHT shined up his way. He talks about it in this episode too to remind us that it happened. Apparently this saved Desmond's life who was also in a moment of despair. Sorry...I didn't mean to recap the whole flashback, but I didn't know what else to do! It all seems so important! Okay, so when we last left Locke he got up from the Beach without his crutches or splint and walked away from the funeral. He just happened to be going back to the hatch to confront the Button one last time. Long story short, Locke finds out Desmond is back on the island the two of them team up to shut down the button (based on their knowledge of the Pearl Hatch). Eko recruits Charlie for help in stopping Locke from his mission. So what went down worth noting? EVERYTHING! Desmond used the trick he learned from Kelvin to force a Lockdown and locked him and "Locke" with the computer. Eko and Charlie find Hurley's stash of dynamite from the Season 1 finale when they blew up the hatch. Eko insanely tries to blow up the BLAST doors (they're not called BLAST doors for the hell of it Eko!) Charlie and Eko have a close call with death as the explosion instead trashes everything else in the hatch as they run for their lives. Locke and Desmond get into some heated debates about the button as Desmond is not 100% convinced yet it's the right way to go. Hell, why should he believe Locke? He's seen the magnet in action! We see Locke show regret for dragging Boone into his whole quest for answers and getting him killed which leads him to tell Desmond the "light in the hatch" story. This pays off in the end. We finally see what was printed on that report (from the Pearl Station) on 9/22/04. 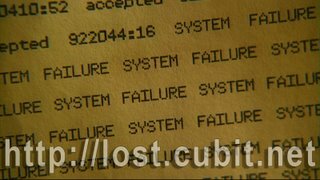 SYSTEM FAILURE which leads Desmond to believe he crashed Flight 815. If everything is not happening by coincidence, then there has to be more to this story. And that would mean that Kelvin had to be involved somehow. 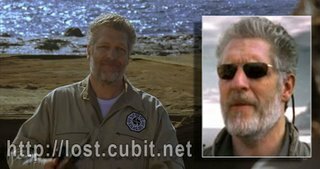 Desmond was MEANT to follow Kelvin out of that hatch on that particular day and that length of distance away from the hatch so that flight 815 could crash on the island. But then how could they control who lives and dies? We know the others had a list! There is still more to this plane crash story! But if that magnet is involved, then we can't say that the producers lied to us. We DID find out why the plane crashed. I have a feeling we haven't seen the last of Kelvin. As the producers alluded to, we should be getting a flashback with The Others on the island pre-crash. Who's to say that we won't find out more about Kelvin's mission in that hatch? If season 3 is when we find out about the others, I'm 90% certain we'll get an episode like this. And of course this all leads to Locke breaking the computer and forcing the clock to run out with no time to enter the numbers. We get our system failure, and everything in the hatch stars self-combusting. We finall get a look at the FULL Heiroglyphics which translate to cause DEATH as we suspected. We confirm that something DOES happen when that button gets pushed and that the PEARL station was the experimental station. (as alluded to by the containers full of notes that ended up in the middle of nowhere) Gotta love when Locke says flat out to Eko "I WAS WRONG"
Did the Electro-Magnet Blow up when the fail-safe went off? Isn't this what Kelvin was suggesting? Whatever happened, a bright light surrounded the entire island and a sound that I couldn't even begin to explain in words. But when the camera fell on Henry Gale there can be no mistaking that he was not surprised or scared that this event happened. Was this part of his plan all along? Afterall, he convinced Locke that nothing happened when that button was pushed. Oh and we also see the crazy Quarantine Hatch Door (must've been the won they already blew off the hatch) fall from very high in the sky, indicating that is one strong magnet! One that could possibly pull apart a plane! Eko, Charlie, Locke, and Desmond were in that hatch when this all went down. We've only confirmed that Charlie survived (and he got some kissing action from Claire in the process...way to go Charlie! Don't think we've forgotten what you did to Sun!). But as I stated earlier, it seems we have more of Desmond's story to tell, which might suggest that he is NOT dead yet. And well, how can you have LOST without Locke? And it seems to soon to part ways with Eko. Plus you don't want to kill ALL season 2 characters off. Then it just looks obvious of what the writers' intent of adding cast was. So we leave our survivors in disarray all over the island. 3 possible survivors in the hatch, 3 heading to captivity with the Others, 3 in a sailboat hanging out up north, and the rest sitting and waiting at the beach camp. They make a phone call to whom? PENNY WIDMORE and say "I think we found it" Wow. So much to speculate with this little tiny scene. First of all, we finally put a nail in the coffin once and for all that this show is NOT about purgatory! We finally have seen the PRESENT DAY off of the island! They were able to pull off 2 seasons without showing what was going on off the island. Pretty impressive stuff. It would seem that Penny has been studying possibly some of her Daddy dearest's business because some unusual events have been happening. Planes disappearing, Sailboats gone missing. Sure it's all speculation, but we know that Penny is looking for Desmond and hasn't given up hope that he's alive. Will they attempt to send a rescue party? 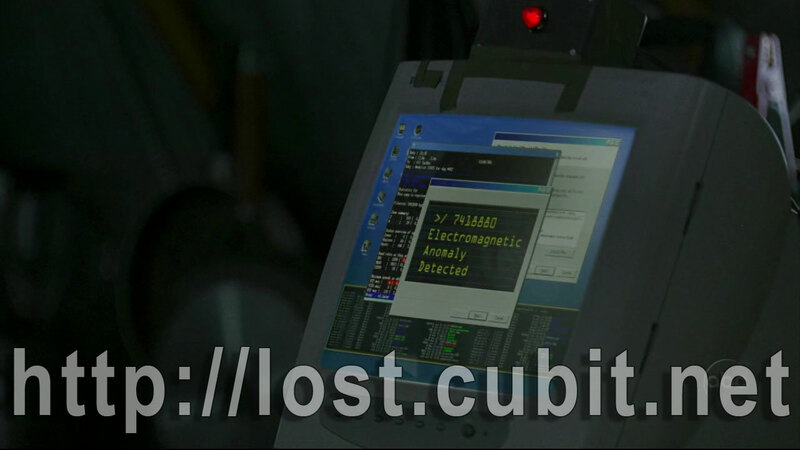 Hmmm I wonder if this is why Henry is convinced that Michael will find rescue because of what showed up on the monitors up at the NORTH POLE? (i'm just going to assume we're talking about Magnetic North...and not just some random blizzardy cold place. I guess Antarctica might make MORE sense since it's closer to where the island SHOULD be). So maybe Michael and Walt WILL get off of the island and we'll see more of their role with Penny and company? I dunno...seems a bit strange. But Henry (or his superiors) seems to have a whole plan schemed. And activating the Magnet seemed to be part of that plan. One more question to ponder this summer. Let's just say for a moment that Locke WAS actually crippled, Rose HAD Cancer, Jin was infertile.....and the Electromagnet cured them from these issues. What happens when the magnet no longer exists? Will we see Locke in a wheelchair next season? Will Rose be sick? You get the point. There still is more going on than meets the eye. And I still think these people have been recruited for some reason or another. Maybe it's not for an experiment as we've been led to believe, but there is a reason all of these people are on that island. And damn it, I'm going to figure it out one of these days! For now, all we can do is speculate all summer. Shouldn't be too tough! I'm sure I'll be analyzing this finale over and over again until I can get my hands on the season 2 DVD. But wow...what a crazy season finale. Again, I apologize for the huge write-up. I could've just typed the script up and it may have been shorter! But I also apologize for the delay in getting it to you. I'm sure I'll think of more theories over time, and I'll just post in comments here. Please don't let me have written this all for nothing! Share your thoughts and theories on the finale too! By the way - Scavenger Hunt:www.hansocareers.com I haven't even looked at it yet. Go to town. If i find anything significant out from this whole Lost Experience, I'll post stuff on the blog this summer. Hope you guys have all enjoyed the blogs for the majority of season 2. I only wish I had thought of it sooner as all of those work emails from season 1 and season 2 episodes 1-6 have been purged and long gone by now. But I'm glad that this blog has seen some mild success. We've grown from an audience of 5-10 to possibly 700 (and that's not counting those who are printing it off and sharing it with co-workers! Hi Mom! Hi Dad!). Very hard to believe that 700 people are reading this thing....especially since barely anyone makes comments! But I expect the usual suspects to chime in with your thoughts! 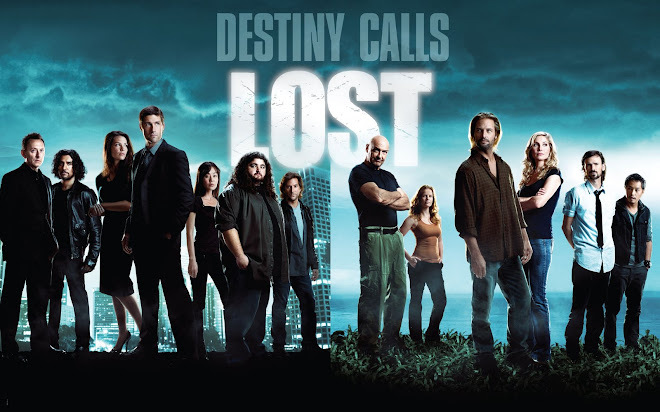 I'm counting on you to make this an exciting summer of Lost discussion! I'll play MY part! Does the fact that Zeke's real name is supposedly Tom mean that he is not Gerald DeGroot, as we had once suspected? He doesn't look much like him without the beard. About the language the researchers were speaking: It's Portuguese, and it resembles the Brazillian accent. The actors aren't native speakers, I can tell you. Putting the weird accent aside, I guess the idea is that those two are Brazillian researchers in Antarctica. Brasil does have a research facility in Antarctica. Joy - yeah...I think over the past episodes the DeGroot rumor has kinda been dismissed in regards to Zeke (Tom, Mr. Friendly). Once Kate found the beard, and once Henry said "the guy with the beard" is NO ONE. But the fact that his name is TOM is a bit intriguing. Let's remember that Jack's father went by the alias TOM on his adventure Down Under with Ana Lucia. There is probably someone on the island he is hiding his true image from. From the looks of it...it's not Jack, Kate, Sawyer, or Hurley....didn't look like any of them recognized him. Lucas, thanks for the confirm. I listened to the Producer's finale podcast over the wknd and they did confirm it was portuguese but they wouldn't confirm if it was Native Portuguese or Brazillian. But You sound like you might be an expert on the subject....so let's go with that! Also...After finally rereading the blog (it was so long i didn't proofread)...i found mistakes. typos I don't care about...but I said that KATE shot one of the others...it was Sawyer. If i find more I'll correct myself here! Thanks for your comments...keep em coming! we have a long summer! Okay, sometimes my mind wanders at work and I start putting pieces of Lost puzzles together. I think I may have just pieced together Locke dreaming about people in Eko's past. THE BLACK SMOKE MONSTER! The smoke was able to collect images/memories from Eko's past...one of those memories..I'm pretty sure was his brother. Who are the two characters that have interacted with the Monster? Yep....Locke and Eko.....maybe somehow they were able to collect these images and somehow get them into Locke's dreams. Sure I can't explain how they are inducing the dreams..... But I don't think it's a coincidence that both John and Eko have come in contact with the monster and that Locke is dreaming of Eko's brother whom he's never met. My 2 cents for the day. fyi - Season 2 DVD Release was moved back to September 5th instead of October 3rd. I'm guessing this is due to the revised plan to air season 2. They'll kick off the 7 episode arch in September with a big cliffhanger after 7 episodes. And then They'll return in the new year with new episodes straight through until the season finale. Just thought I'd pass the update along. I know.... I'm literally years behind...but I am just watching Lost for the first time right now! It is nice to watch so many episodes in a row without having to wait weeks or months, but it is no fun not having anyone to discuss with because everyone already knows that happens! This blog is great and I love reading the recaps after I've finished an episode, it is like I'm not the only one watching for the first time! It's awesome that people are still finding this blog useful even after it has aired. Towards the end of season 3 you'll start to see a lot more comments which will make you feel like you're watching with even more people. ENJOY! Wealthy who stash millions in offshore accounts can no longer hide. Click www.gofastek.com for more information. And oh yeah, the electromagnet could've also cured Jin's impotency, so Sun's baby could be Jin's after all. Though the timing of the conception is still pretty squirrely. I'm rooting for Jin, though, as Jin and (especially) Sun may be my favorite characters on the show. Also love Hurley and Sayid (whose evil past doesn't bother me as much as Kate and Sawyer's cuz Sayid was also doing good things back in Iraq and his evilness was not entirely self-centered but driven by the society he grew up in). I also like Locke. Don't know what they have in store for him next season or beyond, but I like him because he's so human (warts and all) under that crusty exterior of his. 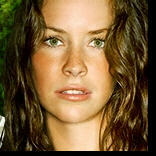 And I have to add that Sawyer and Kate are winning me over, bit by bit. Especially Sawyer, because who can resist a snappy comeback and a handful of awesome nicknames? And boom! Desmond becomes an instant fave as soon as we got his backstory. He already seems like such a well-rounded character and you just feel so sympathetic about him and his travails. I really tried to put myself in Michael's shoes and feel empathy for his desperation to rescue his son. This actually took a bit of time and imagination, but I do also have a son who (when he was about 11) I actually believed had been kidnapped. It was the scariest few hours of my life to think I might never see my son ("They TOOK MY SON!") again. But even after all that, I honestly don't think I could lead four innocent people to their own kidnappings and likely deaths to rescue my own son. It would be a nightmare decision, for sure, but either way I just don't like Michael that much, even as I admire his devotion. Anyway, it was a terrific season finale, and as you can see, I definitely get into the characters more than the plot! 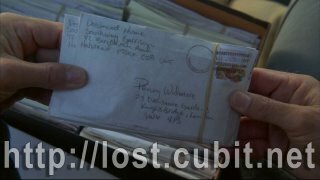 But as a writer myself, I appreciate the tremendous detail and effort that went into 99% of the plotting for Lost. After only two seasons, and with the hindsight of knowing four more (somewhat shorter) season are to come, I already recognize what a monumental, groundbreaking achievement this series would become. But you're liking the characters most of the fans liked at this point...so good to know! Desmond...yeah, he became one of my favorites the minute he came onto the scene. Great character, great backstory. Good point with putting yourself in Michael's shoes. It was tough for a lot of fans. A lot of what we remember about Michael's character in general is "WAAAAAAAAAAAAAAALLLLLLLT!!!!!" It's mostly for the season 2 - Adrift episode. But in hindsight, he yelled Walt's name a lot in season 1 too. lol As for their future past season 2? Well...I don't want to say! I think you still think that I was more into mythology than the characters. I'll continue to try to explain that I wasn't! I really did sink into the details of this show...but I wouldn't have even been interested in doing that if that character development on the show didn't make me want to be that invested. It certainly was a master class in character drama and plotting. Of course, some would argue on the plot stuff by the end. I will still defend the show forever!